FO Friday: Cube Socks Are Done! A month and a half ago, I set out to knit the Cube Socks from knitscene Summer 2018 and try out a new-to-me knitting technique, and now my socks are all finished! This was a fun project to work on, and I love the colorful end result. 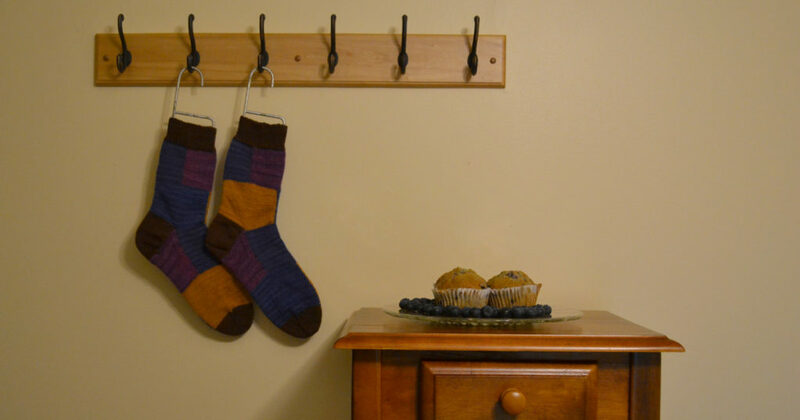 It didn’t take long at all to learn the intarsia-in-the-round technique used in these socks, and working in color blocks helped break up the project into manageable chunks. The color changes also made it easy to count my rows so I knew exactly how much further I had to knit to get to the next section. One thing I wasn’t sure about at first was the garter-stitch edge on the heel flap. I’m used to picking up gusset stitches along a slipped-stitch edge, but picking up along the garter-stitch edge turned out to be surprisingly easy (once I put on my reading glasses)! I chose to pick up my stitches between the garter ridges, which worked well and gave me exactly the number of stitches I needed for the gusset. I absolutely love the finished socks! I chose the medium size, which matched up with the stitch count I normally use for stockinette-stitch socks, and the foot length fits my size 9 feet perfectly without any modifications to the length of the blocks. I’m looking forward to wearing them soon! I only made two changes when knitting my Cube Socks. First, I used size 1 (2.25 mm) needles instead of size 1½ (2.5 mm). 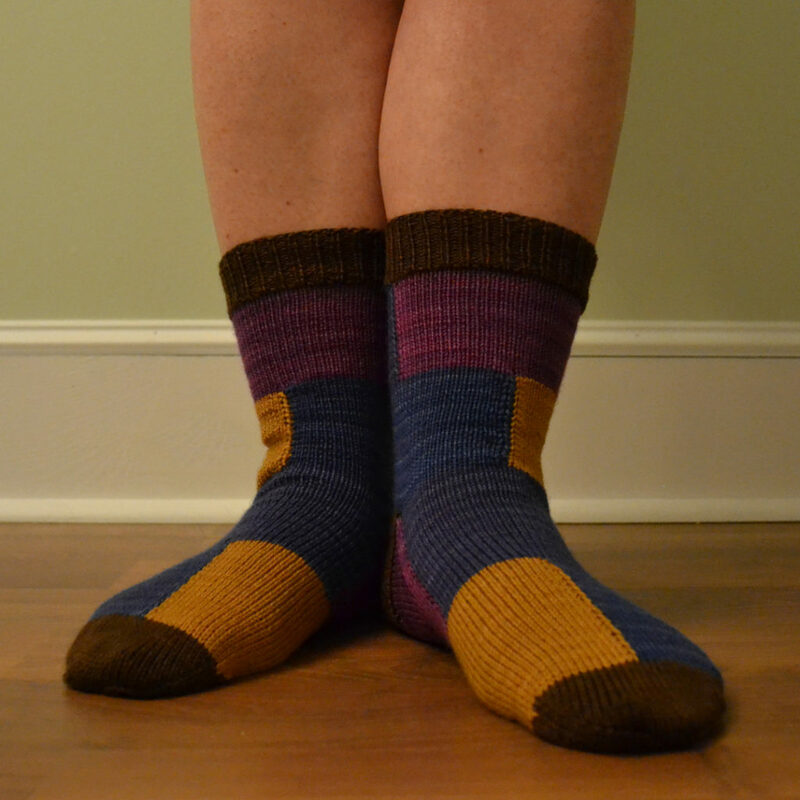 I tend to knit loosely and I normally use size 1 for socks, so I knew without even swatching that size 1½ would be too big. 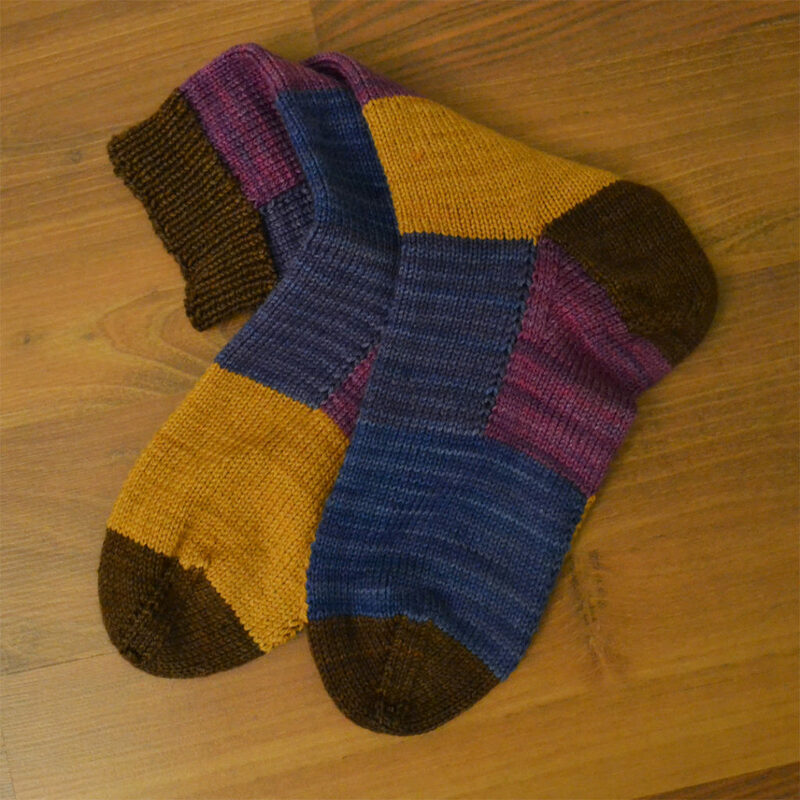 Second, I switched colors D and E on the second sock so that my socks would be mirror images of each other. What can I say, I like symmetry! I’m so glad I knit these socks and learned a new intarsia-in-the-round technique. I hope I’ll be able to use this new skill in a future project—maybe even a sweater.